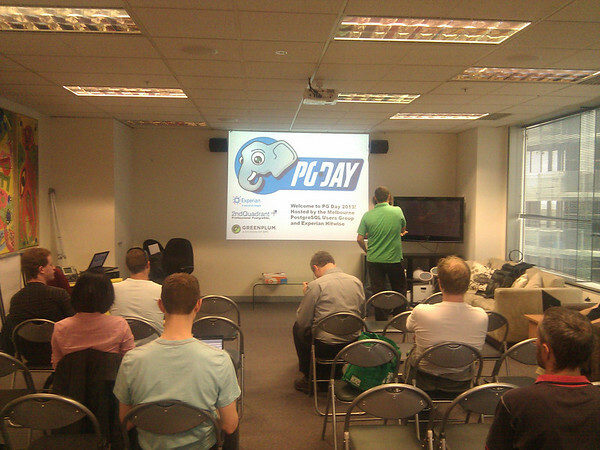 The PyPgDay committee has selected the speakers and talks for PyPgDay 2013. We have an awesome program for you, including talks about monitoring, scaling, performance, Python application development, Django and mobile applications, and speakers from Disqus, Apsalar, VMware, 2ndQuadrant and Uber. While we can't give you everything you want to know about PostgreSQL and Python in one day, we can certainly give you a lot. You also want to register soon, because registration is already 50% full. Check out the list of speakers on the draft schedule. We may reorder them from here, but the talks and speakers are pretty solid. We still have room for some lightning talks. PyPgDay is presented by Disqus. The PyPgDay Party Sponsor is Salesforce.com. The Wifi Sponsor is Heroku.com. PyPgDay is sponsored by Urban Mapping, Uber.com, TransLattice, PostgreSQL Experts, Pandora.com, File-Away.UK and Apsalar. For those who missed the memo, on Friday, February 22nd there will be a full day of PostgreSQL talks at Southern California Linux Expo (SCALE). I will be there, once again doing my "9.2 Grand Prix" talk, hopefully for the last time. I also plan to do "The Seven Deadly Sins of Software Deployment" for UpScale Friday evening. Incidentally, I plan to drive down to SCALE, so if anyone from the SF Bay Area wants a ride, please contact me (josh -at- agliodbs.com).